The weekend trip provided a brief respite in a rush of activity, just two weeks after Nichols was announced as the American Bankers Association’s next president and CEO. As he got up to speed on ABA, he wrapped up his work as head of the Financial Services Forum, a trade group representing the country’s largest banks, insurers and asset managers. 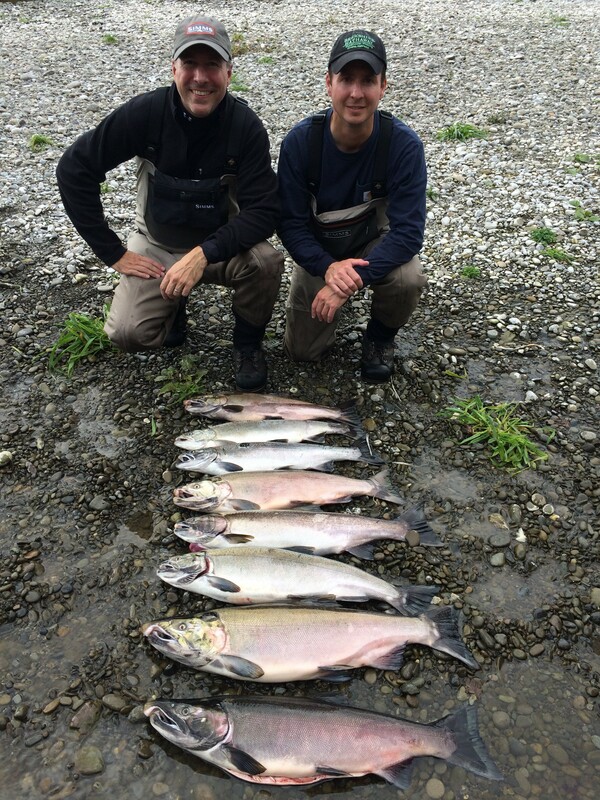 Rob Nichols and his brother, Mark (right), fish the Sol Duc River in Washington state. 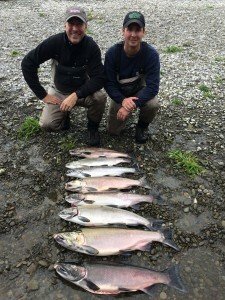 The upstream fight is one a salmon fisherman intuitively understands. Hatched in mountain streams, the wild fish travel hundreds of miles to the ocean, and a few years later—fattened and ready—they fight their way upstream to the very spots where they were hatched, avoiding predators, ascending waterfalls and cascades and gaining thousands of vertical feet. Little wonder they give great sport when hooked. Salmon populations are healthy in the Olympic Peninsula, notes Nichols, who is like most sportsmen a passionate advocate for sustainable fisheries. But the story is different in other parts of the Northwest—particularly the Columbia River basin, where for more than a century hundreds of dams have obstructed the traditional migration patterns of wild salmon. The dams completely changed life for the salmon, which now had to migrate up and down fish ladders at the edges. The fish ladders are often hard to find, and with only one way up or down, sea lions and other predators lie in wait. On the Columbia River, the salmon population is one-tenth of what it was before the big dams went in. Few people argue that the dams should be dismantled—the salmon must adapt to their new environment. Likewise, the regulatory environment for banks has permanently changed. Dodd-Frank and other laws have erected new “dams,” blocking old ways of doing business. In some cases, regulators have established narrow pathways through which bankers must navigate. As the incoming head of ABA, Nichols’ goal is to help bankers not just survive but thrive, finding new pathways through thorny regulatory challenges and keeping the value of their services front-and-center for all Americans. 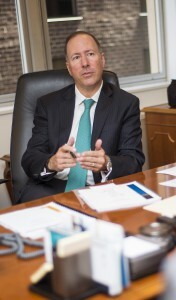 Nichols keeps the average American customer at the center of his vision when communicating about bank issues. His advice to bankers is to “talk about how what you do leads to economic growth and job creation,” and he plans to sharpen this focus at ABA. Central to that rising regulatory burden is the Dodd-Frank Act and the tens of thousands of pages of regulations that implement it. Repealing Dodd-Frank is “unlikely,” he acknowledges, but “making Dodd-Frank work for banks of all sizes is hugely important.” He will focus this year and next on winning meaningful regulatory relief, especially for small banks that cannot afford to bear the compliance burden. Nichols will also keep up ABA’s focus on “policy distortions that create an unlevel playing field,” such as the credit union tax exemption and the Farm Credit System’s status as a government-sponsored enterprise. Nichols is building on the work already done as part of ABA’s Agenda for America’s Hometown Banks, and on the “true partnership” ABA has with the state bankers associations. To get a bill passed in this difficult legislative environment, he emphasizes the need for “bringing customers into the conversation” so that lawmakers understand how bank regulations affect constituents—and for bipartisan action. “He is a bipartisan leader and reaches across the aisle to achieve better results,” says U.S. Bancorp Chairman and CEO Richard Davis. 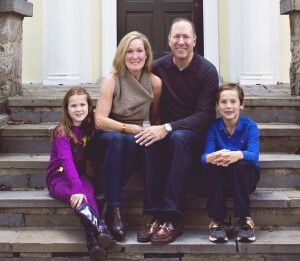 Rob and Rebecca Nichols with their children, Henry and Martha Lauren. Nichols’ first bank experience—one he describes in detail—was as a young boy with a junior savers account at Rainier National Bank in Seattle, where he grew up. He would go to the bank with his father to deposit his earnings from delivering papers and mowing lawns. The bank is long gone, merged into what is now Bank of America, but the memories drive Nichols’ passion for banking. Nichols brought this formative experience to Washington, D.C., where he studied public policy at The George Washington University. After graduating, he worked in the West Wing under George H.W. Bush during the consequential moments of the early 1990s. He was later a top aide to influential Republican members of Washington’s congressional delegation: former Sen. Slade Gorton and the late Rep. Jennifer Dunn. Nichols met his wife, Rebecca, in college; they celebrated their 20th anniversary in July. Their family grew with son Henry and daughter Martha Lauren. Both Rob and Rebecca are fervent advocates for child health; Rebecca serves on the children’s health board at Children’s National Medical Center, while Rob is vice chairman of the nonprofit group Food Allergy Research and Education. Nichols notes that food allergies are growing in prevalence, with one in five kids projected to have a food allergy by 2020. FARE supports scientific research and engages in allergy-focused advocacy—for example, passing a bipartisan bill that encourages states to put epi-pens in schools to treat life-threatening allergic reactions. 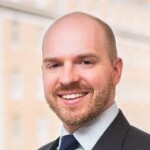 Nichols became immersed in the financial sector as assistant secretary for public affairs at the Treasury Department during the George W. Bush administration. “We spent a considerable amount of time focused on banking policy and trying to create a set of economic conditions where the financial sector could do its important job,” he says. From Treasury, Nichols was hand-picked to lead the Forum. He moved a relatively sleepy outfit from New York to D.C., building it into what Time magazine called “perhaps the country’s most powerful trade association” and earning recognition from the New York Times, The New Republic, The Hill and others as one of the capital’s most effective lobbyists. Not long into his tenure, he faced the financial crisis and mortgage bust, and the Forum helped support emergency actions to “keep markets moving at a time of critical concern,” he says, then fought an uphill battle to shape the post-crisis regulatory restructuring that sought to end too-big-to-fail and deal with the causes of the crisis. As Nichols fights for a better regulatory structure for banks, helps the industry evolve with the future and ensures banks appeal to rising generations of customers, he knows he will be swimming upstream. The obstacles are difficult, but not insurmountable, and he still wears a smile.